The Diamondbacks have announced a new contract with infielder Eduardo Escobar, as Nick Piecoro of the Arizona Republic first reported (Twitter links). It’s said to be a three-year, $21MM pact. Escobar is a client of DJ Rengifo Y Associates LLC. This news represents a fascinating turn of events just before the official onset of free agency. The 29-year-old, who was picked up in a mid-season swap with the Twins, had been slated to reach the open market for the first time. Opting to wait for free agency would surely have given Escobar a shot at a somewhat bigger payday. After all, the switch-hitter just wrapped up a career year in which he slashed .272/.334/.489 with 23 home runs while thriving defensively at third base. MLBTR has yet to release its free agent predictions, but had initially contemplated a contract of three years and $30MM. That said, things don’t always work out as hoped on the open market. There are several strong competitors in the third base market, and teams that like Escobar’s versatility will also be intrigued by Marwin Gonzalez. For Escobar, his broader history is rather less enticing than his 2018 output standing alone. Over the past five seasons, he carries a .261/.312/.433 slash — good for an exactly league-average 100 OPS+. And though he has played all over the diamond, including at shortstop, he hasn’t always graded as a stellar defender up the middle and so may not be seen as much of an option there as he ages. Doing this deal now, then, avoids some risks for both parties. Clearly, both sides liked the fit after only a few months together. And it’s not hard to see how the contract can suit team and player moving forward. Really, the most interesting element of this decision is what it means for the Arizona organization. With the offseason approaching, it had seemed quite likely that the club would embark upon a rebuilding effort. While it’s certainly still possible that he Snakes will look to shift some assets with the future in mind, promising Escobar three years certainly isn’t something that a team would do before a full-blown teardown. With Escobar on hand, it’s also fair to wonder just what the D-Backs plan to do with some other infielders. Jake Lamb will be looking to bounce back from a miserable and injury-riddled campaign, but keeping him will mean ponying up a projected $4.7MM. It remains to be seen what the club will do with Lamb, as well as fellow infielders Nick Ahmed ($3.1MM projection) and Chris Owings ($3.6MM). Ketel Marte is already under contract on a five-year, $24MM extension. 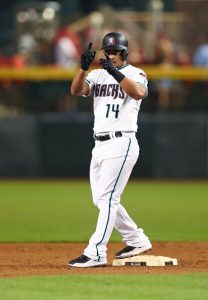 Today’s move leaves the Diamondbacks with plenty of options, particularly given Escobar’s versatility, so it’s hardly a fully committing decision. It also means that the organization has over $130MM in estimated payroll on the books, including its robust slate of arb-eligible players. This year, the Snakes opened with a club-record $131.5MM tab. If the signing hints that the D-Backs will not blow things up entirely, it remains hard to imagine that the club will fully press down on the gas pedal. As MLBTR’s Mark Polishuk recently explored, the organization could attempt to shave some salary obligations, hold onto its pre-MLB talent base, and try to remain as competitive as possible by overseeing a value-oriented winter. Getting Escobar at an appealing rate certainly seems to fit that mold, though the club’s precise course from this point forward remains to be seen. Prior to trading infielder Eduardo Escobar to the Diamondbacks, the Twins approached Escobar’s camp about a potential extension, reports La Velle E. Neal III of the Minneapolis Star-Tribune. However, talks between the two sides didn’t gain much in the way of momentum, which ultimately led Minnesota to move him for a package of three prospects. Neal adds that the Twins are open to trading impending free agents Brian Dozier, Zach Duke and Lance Lynn, though he offers a similar sentiment to The Athletic’s Ken Rosenthal in reporting that Minnesota isn’t inclined to trade Kyle Gibson, who is controlled through 2019. Rather, Neal suggests that Minnesota may offer Gibson an extension this winter on the heels of what is increasingly shaping up to be a breakout season. Any such conversation with Gibson’s camp has yet to take place, though, as 1500 ESPN’s Darren Wolfson recently tweeted. Following the acquisitions of outfielder Brett Phillips and right-hander Jorge Lopez in the Mike Moustakas trade, Royals general manager Dayton Moore suggested to reporters that his club may not be eyeing an especially lengthy rebuilding process (link via Maria Torres of the Kansas City Star). Moore indicated that the proximity of both Phillips and Lopez to the Majors held significant appeal to the Kansas City front office. “We didn’t want to do a prospect-type deal in this case, because of the nature of where we are at the major-league level and what we’re trying to accomplish,” said Moore. “We don’t like losing games and we don’t like where we are right now with the major-league team, so we wanted to try to seek talent that was going to help us sooner than later.” That meshes nicely with the Royals’ targeting of college arms in the top several rounds this year’s draft. Though White Sox fans are ravenously anticipating the promotion of prospects Eloy Jimenez and Michael Kopech (particularly the former), general manager Rick Hahn preached patience when asked about the pair’s timeline to the Majors (link via Tom Musick of the Chicago Sun-Times). “While you can look at a stat line or you can look at a box score and say, ‘This guy looks like he’s doing well, looks like he’s ready,’ our checklist that we want these guys to answer is a little more lengthy than that,” Hahn said, though he declined to delve into specific elements that need improvement with each player. Hahn added that even a trade of a player on the roster (an outfielder or starter) wouldn’t necessarily prompt a promotion for either. “It’s not going to be a function of any level of eagerness that fans or coaches or myself or the front office has,” said Hahn. The GM also discussed the trade of Joakim Soria and potential for other moves. The Diamondbacks have officially struck a deal with the Twins that sends infielder Eduardo Escobar to Arizona. Ken Rosenthal and Dan Hayes of The Athletic (Twitter link) reported an agreement was close, while Jon Heyman of Fancred tweets that there is in fact a deal in place. In return, the Twins will get three Class A ballplayers in the deal, Jeff Passan of Yahoo Sports tweets. Righty Jhoan Duran and outfielders Ernie De La Trinidad and Gabriel Maciel are all going to Minnesota. John Gambadoro of Arizona Sports 98.7 had tweeted that a trio of minor-leaguers would go to the Twins in the deal. 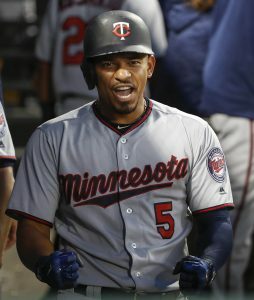 Escobar will reach free agency at season’s end, making him an obvious trade piece for the Twins. While the Minnesota club is still not fully buried in the AL Central, with a seven-game deficit, the club obviously determined that it was not close enough to the talented Indians to hold off on moving veteran assets. With the deadline drawing near, Escobar arguably rated as the top infielder available. He is earning just $4.8MM this year, so his salary was rather easy to absorb for most contenders. Esobar sat at 18th on MLBTR’s recent listing of the top 75 trade deadline candidates, though he would have been significantly higher had it been clear that the Twins were ready to deal. Even with Escobar leaving the market, there still remain quite a few other potential infield targets. Top rentals include now-former teammate Brian Dozier (who is likely limited to second base), Asdrubal Cabrera, Adrian Beltre, Ian Kinsler, and a group of veteran shortstops (Adeiny Hechavarria, Jose Iglesias, Freddy Galvis). For the time being, at least, it seems likely that Escobar will slot in at third base, which is where he has spent most of the year. D-Backs incumbent Jake Lamb is dealing with a shoulder injury that may require a DL stint. He has also struggled mightily at the plate this year after two consecutive quality campaigns. Escobar certainly has not had any difficulties putting bat to ball in 2018. He’s sporting a career-best .274/.338/.514 batting line with 15 home runs through 408 plate appearances. That’s a fair sight more than the switch-hitter has ever produced at the plate over a full season in the past, though Escobar has posted roughly league-average batting lines in three of the past four campaigns. Of course, the Diamondbacks will surely still hope that Lamb can return and provide a boost. It’s notable, then, that Escobar has extensive experience at shortstop and also has spent time at second base (as well as the corner outfield). He may ultimately end up moving around the diamond as needs dictate down the stretch. On the Twins’ side, there’s some interesting young talent coming back. Per MLB.com’s recently updated organizational rankings, Maciel ranked as the 11th-best prospect in the Arizona system, with Duran listed in the 19th spot. Maciel is valued for his ability to get aboard and do damage on the basepaths when he does. Entering the season, Baseball America rated both of those players among the thirty best Diamondbacks prospects. In their latest look, they bumped Duran into the club’s top-ten list on the basis of his big heater and “power curve.” While he still needs a third pitch to profile as a future starter, it seems there’s a lot to like about his arm. Philadelphia and Baltimore have been linked in trade talks for much of the summer, as the Phils were known to be suitors for Manny Machado and Zach Britton before both former O’s stars were dealt to the Dodgers and Yankees, respectively. It’s fair to assume that the Orioles have a very good sense of the Phils’ farm system at this point, both from scouting and negotiations and the simple fact that there are more than a few former Baltimore executives in Philadelphia’s front office (chief among them club president Andy MacPhail and GM Matt Klentak). Jones, who turns 33 on August 1, is owed roughly $7MM for the remainder of the season. He’s a free agent this winter, so he’d represent a pure rental for the Phillies, who would get a veteran upgrade in their outfield that wouldn’t represent a long-term roadblock for younger talents like Nick Williams. With Odubel Herrera locked into everyday center field duty, Jones’ likeliest role with the Phillies would be to take over from Williams as the regular right fielder. It’s worth noting that Williams (.250/.329/.438 in 286 PA, 12 homers, 104 OPS+, 105 wRC+) is actually hitting better than Jones (.277/.304/.422 in 411 PA, 10 homers, 100 OPS+, 96 wRC+) this year, though Jones brings a much longer track record of performance to the table. Williams also has been a very subpar defender in right field, so Jones should represent an upgrade in that area even if his own metrics in the more challenging center field position have been well below average for the last three years. The recent demotion of Aaron Altherr left the Phillies in need of a backup outfielder, so Williams would step into that role. Escobar has mostly played third base for the Twins this year, though with Maikel Franco hitting better in recent weeks, the Phillies would likely use Escobar in place Scott Kingery at shortstop. Escobar is in the midst of an outstanding .278/.338/.522 campaign over 397 PA, and the 29-year-old has also delivered 15 homers and a league-best 37 doubles. He is another rental player, and only has roughly $1.7MM still owed to him for the rest of the season. Among the many trade proposals being tossed around behind the scenes, The Athletic’s Ken Rosenthal (Twitter links) hears that the Twins have been approached about dealing Brian Dozier and Eduardo Escobar in the same trade, while teams interested in Zach Britton have also asked the Orioles about a larger deal involving Dylan Bundy or Kevin Gausman. Rosenthal is doubtful either scenario takes place, as Baltimore may not be looking to deal from its rotation and, more generally, teams usually prefer to deal players individually rather than package together several trade chips in a single blockbuster move. In regards to the Twins, Rosenthal speculates that the Brewers could have been the team who asked about the multi-player deal — Milwaukee has the most glaring need of any contender for middle infield help, and the Brew Crew has been connected to both Dozier and Escobar in reports. Though an oblique strain sent Michael Fulmer to the DL on Friday, at least one team still has some trade interest in the Tigers right-hander, a rival scout for the mystery team told The Athletic’s Emily Waldon (Twitter link). Much depends, obviously, on how quickly Fulmer is able to return from the injury, as he wouldn’t be able to pitch in the postseason for any club that acquired him after August 31. I’d think that unless Fulmer makes an unusually speedy recovery, the Tigers would prefer to wait until the offseason so they could gain full value for what might be their best trade asset. The Athletics can probably be ruled out as the team still in on Fulmer, as Susan Slusser of the San Francisco Chronicle (Twitter link) notes that the A’s had “some interest,” though that was prior to the injury news. Mets assistant GM John Ricco discussed his team’s trade of closer Jeurys Familia to the A’s while speaking with reporters (including the New York Post’s Zach Braziller) today, saying that the Mets felt they would’ve received a worse return for a rental player like Familia had they waited longer for a deal. The fact that Oakland was willing to take on the remainder of Familia’s contract wasn’t a major factor, as Ricco said the Mets are willing and able to take on salary in other trades. “We made the judgment the talent level for eating money wasn’t going to be there, so we decided to do the [Familia] deal where we moved the money,” Ricco said. Ricco’s explanation notwithstanding, the Familia trade has drawn criticism for the relatively small return (two minor prospects and $1MM in international bonus money) the Mets received, particularly with so many teams looking for bullpen help. Sources from rival teams interested in Familia told The Athletic’s Jim Bowden (subscription required) that they didn’t know why the Mets didn’t approach them one final time to give them a chance to top Oakland’s offer. More favorable reviews were given to the Manny Machado deal between the Orioles and Dodgers, from front office executives and scouts surveyed by Baseball America. Speaking anonymously, the evaluators spoke positively about the five-prospect package Baltimore received for Machado, particularly since [which could also go to the Mets’ logic on dealing Familia when they did] rental players have become harder to move in the modern trading climate. “For a rental these days, getting [Yusniel] Diaz and [Dean] Kremer was good in my opinion. In general I don’t see teams sacrificing top talent for two-plus months (of a big league player),” one American League front office official said. While the Mets have received substantial interest in both Jacob deGrom and Noah Syndergaard, a trade of either still seems unlikely to happen, per James Wagner of the New York Times (all links to Twitter). The Mets are seeking elite prospects and/or young MLB-ready talent for both pitchers, and it’s been tough to find a fit. Contending clubs, such as the Braves and Yankees, have that type of talent but are reluctant to include it in deals. Other contenders, like the Giants and Diamondbacks, don’t necessarily have the type of pieces the Mets are seeking in return. As Wagner notes, many of the best prospects in baseball are on non-contenders/rebuilding teams, such as the White Sox, Blue Jays and Padres — clubs that are spending more effort to trade pieces away at the moment. Wagner adds that he hears the Padres like Syndergaard, though, and hope to contend in the near future, so they could pursue him this offseason. For now, however, Asdrubal Cabrera, Jeurys Familia and Zack Wheeler are the likeliest Mets to be moved. Adding a reliever or two appears to be the Braves’ top priority prior to the July 31 non-waiver deadline, tweets David O’Brien of The Athletic. Atlanta could alter that approach and pursue a rotation option, but there’s a considerably larger supply of available relievers, even after this morning’s blockbuster sending lefty Brad Hand and right-hander Adam Cimber from the Padres to the Indians. General manager Alex Anthopoulos recently suggested that the team would be reluctant to part with too much young talent in order to acquire a rental player. It’s not entirely clear what the Phillies were offering in their efforts to acquire Manny Machado prior to the trade that sent him from Baltimore to L.A., but Jayson Stark of The Athletic tweets that the Orioles did “extensive background work” on right-hander Adonis Medina, outfielder Adam Haseley and left-hander JoJo Romero. Ultimately, though, the Orioles believed that the Phillies couldn’t (or perhaps weren’t willing to) match the upside that existed in headliner Yusniel Diaz, which prompted the O’s to ship Machado to the Dodgers. Though many Phillies fans are disheartened to see Machado head to the Dodgers, Jim Salisbury of NBC Sports Philadelphia writes that the club will remain active on the trade market. Salisbury lists Twins shortstop Eduardo Escobar, another impending free agent in the midst of a strong season, as a potential target for the Phils. Escobar, 29, is hitting .271/.327/.507 with 14 homers and an MLB-leading 35 doubles to this point in the 2018 season. He’s better at third base than at shortstop but has substantial experience at both positions. On the pitching side of things, Salisbury suggests that Jeurys Familia, Felipe Vazquez and J.A. Happ could all emerge as targets for the Phils. Adding Happ could allow the team to move Vince Velasquez or Nick Pivetta to the ’pen, Salisbury adds. It’s been suggested that if the Marlins don’t trade All-Star catcher J.T. Realmuto this summer, the team could approach him about a long-term contract in the offseason. Realmuto spoke with Andre C. Fernandez of the Miami Herald about that possibility, and while he stressed that his current emphasis is on the 2018 season, he’s not closed off to the idea even after last offseason’s reported request for a trade. “If they approached me, I wouldn’t be opposed to having the conversation,” said Realmuto about a possible extension. “…The fact that they would think of me that way, to build around me, is an honor.” Realmuto acknowledged the Marlins’ improved play recently — they’re 21-18 over their past 39 games — and expressed confidence that the club will continue to improve over the season’s second half. The Marlins are drawing interest in relievers Kyle Barraclough, Drew Steckenrider, Adam Conley and Brad Ziegler, writes Joe Frisaro of MLB.com, but president of baseball operations Michael Hill acknowledges that he’s placed a lofty price on the former three, each of whom has at least three years of control beyond 2018. “You’re talking about trading one-pluses and two-pluses [years of service time],” says Hill. “If I call and I’m trying to acquire a one-plus, or two-plus, I know it’s going to be costly. Our game is about maximizing value, and control of players.” Hill adds that despite the Marlins’ rebuild — or “build” as the organization is terming it — his goal is to win as often as possible. The Indians, Astros, Red Sox and Dodgers have all been previously linked to Miami’s bullpen. Furthermore, Frisaro notes that while teams will inquire about catcher J.T. Realmuto in the coming weeks, the asking price remain extremely high. Realmuto may even be approached about a contract extension this offseason, per Frisaro, though that may be a tough sell after the Fish shipped out the Marlins’ entire core last offseason. Padres reliever Kirby Yates has emerged as a terrific setup option in San Diego, but ESPN’s Jerry Crasnick spoke to one scout who expressed doubts that the Padres would find someone willing to meet their asking price in a trade (Twitter link). “He’s been really good. But he’s not going to get the return they’re asking for, because he kind of came out of nowhere,” the scout said. “It’s hard to give up a pretty good prospect for a guy who’s had three good months.” Of course, it’s worth noting that Yates performed well for the Friars all through the 2017 season as well. However, he didn’t adopt the splitter that has become a wipeout pitch for him until the current season, which is likely the point to which that unnamed scout was alluding. Yates has a ridiculous 1.51 ERA with 11.4 K/9, 2.8 BB/9, 0.25 HR/9 and a 49.4 percent grounder rate in 35 2/3 innings this season. The 31-year-old can be controlled through 2020. The Brewers have been in contact with the Twins about infielders Brian Dozier and Eduardo Escobar, tweets Jon Morosi of MLB.com. There’s no indication that talks are serious or have extended beyond preliminary stages, though the Milwaukee middle infield has been a weak point in 2018. Brewers second basemen entered play hitting a combined .248/.299/.376, while their shortstops have batted just .202/.255/.300. Milwaukee has been heavily linked to Manny Machado, of course, but either Minnesota slugger would represent a less expensive option — both in terms of prospect capital and salary. Reports have suggested that the Twins are open to selling off pieces, but the Twins have also won six of their past seven and play in a weak division. Though the Rays have surprised and as of Tuesday sit four games over .500, they’re still buried in the AL East, and Peter Gammons of the Athletic tweets that their goal this month is to extract as much as they can in trades for Wilson Ramos, Nathan Eovaldi and Adeiny Hechavarria. Gammons notes that the Rays have also been getting inquiries on right-hander Matt Andriese, though, as teams scour the market for relief help. Andriese, 28, is controlled through 2021 and has a 3.63 ERA with 8.1 K/9, 2.3 BB/9, 0.87 HR/9 and a 51 percent grounder rate. He’s capable of working both in the rotation and ’pen, as well, so teams likely have interest in him in a variety of roles. Eduardo Escobar wasn’t supposed to get this much playing time in 2018. 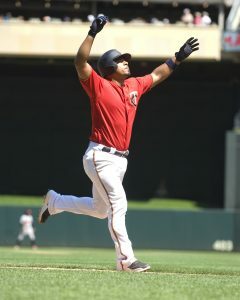 Heading into the season, he was set to be a utility player extraordinaire, backing up Twins shortstop Jorge Polanco, third baseman Miguel Sano and second baseman Brian Dozier — perhaps with an occasional day at DH or a brief foray into an outfield corner. But an 80-game suspension for Polanco following a failed PED test and an early injury for Sano thrust Escobar into the lineup with regularity. And more surprisingly, Escobar’s sensational performance has thrust him into the cleanup spot for the Twins more often than not. There are undoubtedly readers out there who literally don’t know who Escobar is. He’s long been a quality utility piece for the Twins, but he’s taken his offensive game to new heights over the past two seasons. Now, four months away from free agency, he looks potentially poised for a payday that would’ve sounded unthinkable for him entering the 2017 season. Escobar, 29, is off to a ridiculous .286/.340/.562 start to the 2018 season (143 OPS+, 139 wRC+). The switch-hitter already belted a dozen home runs and racked up an incredible 24 doubles through his first 238 trips to the plate. It’s an excellent followup to last year’s career-high 21 homers, and he’s already just nine long balls and 11 doubles shy of his career-bests with about 60 percent of the season still to play. While it’s not always obvious to see the areas from which a player’s offensive breakout stems, Escobar has made some very noticeable changes to his approach at the plate. He looks to be one of the many success stories from 2017’s “fly-ball revolution,” having increased his launch angle from 15 degrees in 2016 to 17.5 degrees in 2017 to 20.8 degrees in 2018. Back in 2016, Escobar was putting the ball on the ground nearly 40 percent of the time he made contact. But his fly-ball rate jumped from 37.4 percent in 2016 to 45.3 percent last season. This year, it’s sitting at a career-high 47.9 percent. His average exit velocity of 87.6 mph isn’t elite, but it’s steadily risen by about 1 mph in each of the past two seasons. That seems like a deliberate focus on putting the ball in the air and hitting for more power, and it’s somewhat predictably come with some other, more negative changes. Escobar has traded some contact for his newfound power, striking out at a career-worst 22.7 percent so far in 2018. He’s chasing a whopping 40.4 percent out-of-zone pitches, and his swinging-strike rate is a career-worst 12.7 percent as well. That said, his strikeout rate is far from egregious, and he’s also sporting career-bests in hard-contact rate, line-drive rate and barreled-ball rate. His .327 average on balls in play is a bit north of his career .299 mark, but that can be somewhat explained by his increase in barreled balls and quality contact. In short, he looks like a legitimately improved hitter. Defensively, Escobar is more of a mixed bag. He has extensive experience at both positions on the left side of the infield in addition to 348 innings at second base and 275 innings in the outfield (eight in center and 267 in left field). That’s desirable versatility, but he’s not exactly a standout defender anywhere. Third base has been his best position in the Majors, and by measure of both Ultimate Zone Rating and Defensive Runs Saved, he’s a serviceable defender at the hot corner. DRS pegs him at -5 runs 1735 innings, while UZR/150 has him at -0.4. His ratings at shortstop, particularly in 2018, are far less appealing (-8 DRS in 168 innings, -2.1 UZR), but he’d graded out passably (even favorably, per UZR) at the position in prior seasons. At the very least, a team would likely feel comfortable installing Escobar at shortstop once or twice per week, knowing he could be re-positioned elsewhere in a late defensive switch by a superior defender. And it stands to reason that most clubs would feel comfortable with his glove at third base. The question for Escobar in free agency, of course, will be one of how exactly he’ll be valued by other clubs. Escobar isn’t going to sustain a .276 isolated power mark (that is, slugging percentage minus batting average). By his own admission, many of his doubles are of the “hustle” variety (such as this one), and his 15.2 percent homer-to-flyball ratio is well above his career norm. Still, at least much of the gains he’s made in the power department seem legitimate. He’s also sporting a modest increase in walk rate (career-high 7.6 percent) to go along with his improved contact and defensive versatility. Some teams figure to value him in as a high-end utility player, while others yet may feel he’s capable of shouldering an everyday workload. Looking for recent comparables, there aren’t many examples of bat-first utility players that stack up nicely with Escobar’s case. Ben Zobrist’s four-year, $56MM contract was signed when Zobrist had a considerably lengthier track record and seems too ambitious a comparison for Escobar. On the other hand, former teammate Eduardo Nunez’s modest deal to return to the Red Sox this year feels like it can be similarly dismissed, given Nunez’s late knee injury and lack of power. Luis Valbuena’s two-year, $15MM contract feels too low, given Escobar’s ability to play some shortstop, his switch-hitting capability and his superior offensive output. Jed Lowrie’s three-year, $23MM deal with the A’s may even be light. That contract began when Lowrie was 32 years of age and came on the heels of a season in which he played in just 69 games. Escobar will turn 30 next January. Perhaps, then, Escobar will forge his own path, to an extent. He’s experiencing an offensive breakout similar to the one that Zack Cozart exhibited in his two years leading up to a three-year, $38MM deal from the Angels, though Cozart was considered a premium defensive shortstop who could provide significant defensive value at third base as well. Then again, he hadn’t been as healthy as Escobar and was two years older. That could serve as something of a ceiling for Escobar, and perhaps a four-year deal at a lower annual rate (something in the vein of Omar Infante’s admittedly dated four-year, $30.25MM deal with Kansas City) shouldn’t be entirely ruled out, given Escobar’s relative youth. All of this, of course, is predicated on Escobar sustaining a pace that at least approximates his current output. That’s far from a given, especially considering the fact that Polanco’s eventual return will cut into his playing time to some degree. But heading into the 2018 season, the general thought was that if there was one switch-hitting utility player poised for a significant payday, it’d be Houston’s Marwin Gonzalez. With Gonzalez struggling and Escobar thriving, that reality looks to have shifted. There are under-the-radar free agents who emerge from relative anonymity every season, and Escobar is making his case to become the latest such example with a strong start to the year.